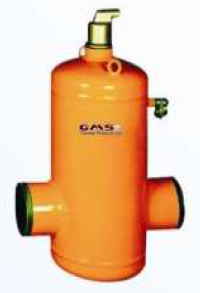 The Air Separator must be installed at the hottest part of the system. In a heating system this is the main flow from the boilers. The static head must not exceed 30 metres. In a chilled water system the unit must be located in the return close to the chiller. Maximum static head must not exceed 15 metres. If the static head is greater than these figures the efficiency is reduced. The maximum flow rate through our unit is 3m/sec. If these values are exceeded the efficiency is reduced. Higher pressure and temperature models are available on request. Please consult the data leaflet for more information on our standard range of Air and Dirt Separators or contact us directly.